VANCOUVER B.C., Dec. 6, 2012 (GLOBE NEWSWIRE) -- International Lithium Corp. ("ILC" or the "Company") (ILC:TSX-V) is pleased to announce that the Company has initiated permitting and preparations for drilling and bulk sampling brine for metallurgical testing on their wholly owned Mariana Potash-Lithium project in Argentina. A combination of sonic and reverse circulation drilling is planned to occur in the first half of 2013 to develop an understanding of the resource potential for the entire salar, but focusing on the potash and lithium concentrations and distribution in the central one-third of the salar. GEOS Mining, an Australian geological consultancy with experience in brine resource estimation, has been retained to assist in planning the project and carry out the necessary studies to support a resource estimation if warranted at this stage. The Company will also collect bulk samples of the brine to be used for more advanced process and recovery testing. The implementation of a program to install test evaporation ponds and a pilot plant is being considered for this stage in addition to hydrogeological, climatic and geophysical studies. "It is important to our strategic partner that we gain an early understanding of the variations in the unique chemical composition of our source material. 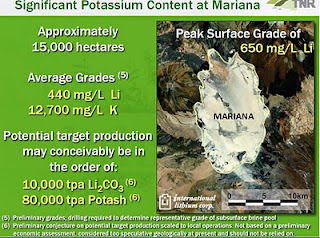 We will be working closely with their technical teams to evaluate process methodology and determine final lithium and potassium products that can be produced from the Mariana brines." commented Kirill Klip, President of International Lithium Corp., "By conducting these studies prior to a detailed resource evaluation, we can better direct our efforts to determine the economic viability of the project." The Mariana potash-lithium brine project at Salar de Llullaillaco in Salta, Argentina, consists of several contiguous mining claims that cover an expansive 160 square kilometres. The claims strategically encompass the entire salar and a significant portion of the surrounding area (to provide site facilities for a processing plant if the project proves to be economically viable). The claims are 100% wholly optioned by the Company. Salars, or salt lakes, host some of the largest known lithium resources in the world and the Mariana basin is one of the more prominent salars in the renowned lithium belt of South America, currently accounting for more than 70% of global lithium production. Initial surface brine sampling revealed highly compelling geochemistry reporting average grades of 440 milligrams per litre ("mg/L") lithium and 12,700 mg/L potassium. The potassium levels were unexpected and represent some of the highest grades comparative to any of the neighbouring salars outside of the world class operation on the Atacama salar in Chile. International Lithium Corp. previously drilled four widely spaced reverse circulation drill holes (totalling 444 metres and positioned approximately 5 kilometers apart) to characterize the subsurface strata and brine within the 10 x 15 kilometer salar (salt lake). Results indicate homogeneous geochemical concentrations to the maximum depth of the holes (approximately 100 metres). The upper stratigraphic interval is primarily halite varying in depth from 18 to 32 metres in the peripheral areas and 66 metres deep proximal to the center of the salar. Below this predominantly halite layer an extensive mixed evaporite layer approximately 32-52 metres thick, consisting of greater than 60% fine to coarse sand, was encountered in the three peripheral holes. Below the evaporite sequences in all holes, an extensive medium to coarse grained, dark coloured, basaltic sand interval was encountered. Brine flow measurements recorded during drilling increased markedly below the halite sequence throughout the sand rich layers. Unconsolidated stratigraphic units with a significant granular or sand component possess physical characteristics that allow them to maintain a higher degree of permeability and porosity at greater depths than halite (salt) units. Consequently, they represent a potential aquifer for hosting brine at depth and are an important target in the lithium-potash brine exploration model. The measured brine densities, ranging from 1,190 to 1,298 grams per litre ("g/L"), reflect a considerable quantity of dissolved salts, approximately 10 times the salinity of seawater. John Harrop, P.Geo, FGS, is the Company's Qualified Person on the project as defined under NI 43-101 and has reviewed the technical information contained in this press release. Ganfeng Lithium, based in Xinyu, Jiangxi Province, China, is a professional producer of lithium products which has developed a comprehensive product chain, including lithium metal and alloys, inorganic and organic lithium chemicals, supplies a wide range of lithium products for primary and secondary lithium battery market, pharmaceutical and new material industries. Ganfeng Lithium's principal market is in China with international exports to Europe, Japan, the USA and India. Ganfeng Lithium was founded in 2000 and listed on the Shenzhen Stock Exchange in August 2010, notably as the first publicly listed lithium company in China and has experienced rapid continuous growth over the last 11 years. Ganfeng Lithium is a major shareholder and strategic partner to International Lithium Corp., currently holding approximately 17.5% of the issued and outstanding shares of ILC.